Will Regulations Really Make 'Honey Oil' Labs Safe? In a matter of weeks, the potentially explosive process of making a highly concentrated form of cannabis known as "honey oil" will be legal in the state of California. Honey oil is a highly concentrated form of marijuana often made using potentially explosive gases – like butane. "I just strongly feel like this should not be legal … something can always go wrong," Selina Cervantes said. The immediate aftermath of the explosion that scarred Cervantes was captured on motel surveillance video. The 22-year-old can be seen walking in a daze following an explosion. "I honestly didn’t feel anything," she said. She had no idea that 93 percent of her body was burned. She had been asleep in an adjoining room, as her boyfriend was making honey oil. She says "the process" of making honey oil is what’s dangerous. Advocates for California’s new law say it is designed to make honey oil production safer. "If you’re doing it in your garage, under no circumstance is that safe," Justin Beck of Cultivation Technologies said. That’s why Beck believes in regulation. Cultivation Technologies in the Coachella Valley is the state’s first locally legal extraction lab. The lab is capable of producing 10,000 pounds of honey oil a month. The industrial equipment is designed to contain the highly flammable gases used to extract THC. "An industrial scale of a lab like this – you’re replacing the black market," he said. But not everyone agrees that regulated labs will eliminate illegal labs. 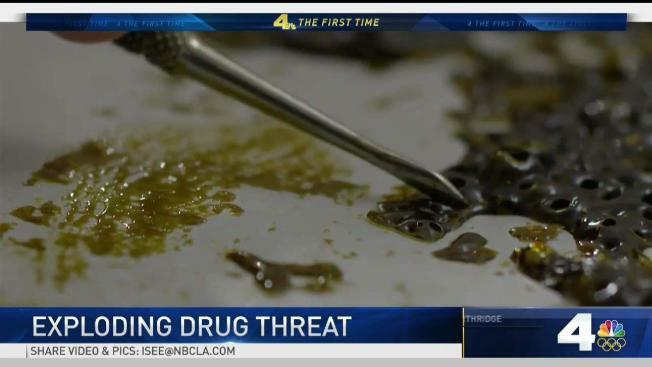 LAPD Narcotics Detective Keith Honore says his biggest fear when January comes around is that smaller mom and pop or tabletop garage clandestine BHO labs "start blowing up." He warns that even in controlled environments something can go wrong. "All it needs is an ignition source," Honore said. Cat Packer, who heads Los Angeles’ new Department of Cannabis Regulation, doesn’t think "we’re ever going to eliminate the illicit market." Packer says her aim is to "reduce" the amount of people who are participating in the activity. She’s charged with implementing marijuana laws for the city of LA – including operating extraction labs. But even this close to January – much of the framework is still in draft form, including the permits needed to operate a lab. "In no means should people think – come January 1 they can just start doing what they want to do – that is not the case," Packer said. As NBC4 has tracked many times, people not involved in making the honey oil are the ones who are severely injured. "Nothing is going to eliminate the market. People are going to say it’s legal. We can go buy this and we can do it however we want to do it … because it’s legal," Cervantes said. Under the new guidelines, legal labs will not be allowed in home, or residential areas. Anyone seeking a permit will need a facility with industrial ventilation, several clearly marked exits, and approval from the fire department.